These are but a few of the anti-Semitic attacks that have blighted the country in recent months. 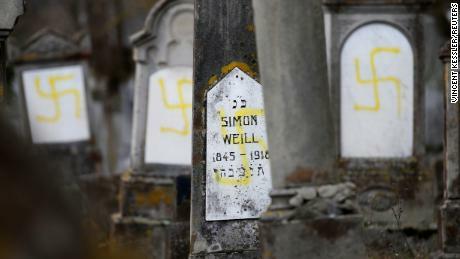 Home to Europe’s largest Jewish community, France has seen a 74% rise in anti-Semitic incidents over the past year, according to French authorities. 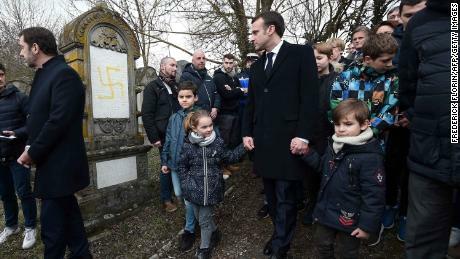 French President Emmanuel Macron has gone as far as to say that anti-Semitism is at its worst levels in France and in other parts of Europe since World War II. 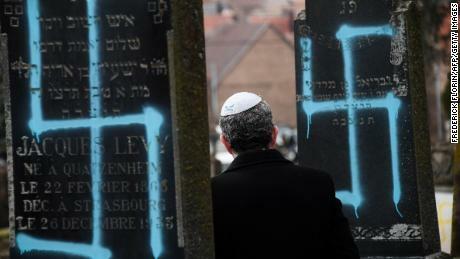 Studies have shown anti-Semitism is rising sharply across Europe but this violent resurgence in France has triggered some deep soul-searching with many asking: what’s behind it? Why now? Some have questioned the Yellow Vest movement and whether its radical fringe is partly to blame for the sudden uptick. “Anti-Semitism was going strong before the yellow vests, but it’s even stronger today thanks to some of them,” the head of the French Council of Jewish Institutions, Francis Kalifat, said last month. “Gilets Jaunes, Colere Noir” is a popular slogan among the leaderless movement, meaning “Yellow Vests, Black Rage.” For almost four months it’s this rage that has poured out along the Champs Elysees, shattering shop windows, leaving police officers wounded and symbolically knocking the Marianne, a national figure who embodies the French Republic, off her perch. Vitriol previously expressed in anonymous tweets has materialized in large letters plastered across the Arc de Triomphe monument for all to see. Offensive mutterings that were confined to the home have been amplified and have now taken center stage, as protesters scream their lungs out on live television. 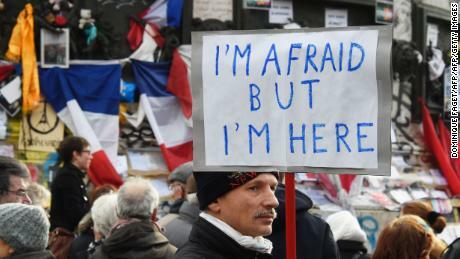 France has seen an unprecedented public expression of hate, where nothing now seems to be off-limits. The Yellow Vests are not an anti-Semitic movement per se but in a climate where every voice is considered legitimate, anti-Jewish sentiment has found a prominent platform. Thierry-Paul Valette, a spokesman for the Yellow Vests, rejects the accusation that the movement has empowered hate speech. “We didn’t fuel anti-Semitism or hate, we simply put a mirror up to society,” Valette says. France has a chequered and painful past with anti-Semitism. Even before the Nazi collaboration of the Vichy regime there was the Dreyfus affair, the case of a Jewish army captain who was wrongly accused of spying for Germany: a miscarriage of justice rooted in blatant anti-Semitism that divided France at the end of the 19th century. And since the 1990s, a virulent left-wing anti-Semitism has flared up, mirroring the peaks and troughs of violence in the Israeli-Palestinian conflict. And on the right, nationalist anti-Semitism has been embodied by Jean-Marie Le Pen, a convicted Holocaust denier and founder of the National Front. There’s no doubt that the far-left and right have been a part of the Yellow Vest movement. Pictures and videos of demonstrators performing the “quenelle,” a downward pointing gesture believed by some to be a Nazi salute in reverse, have emerged online. The quenelle was invented by French stand-up comedian Dieudonne M’bala M’bala, a controversial entertainer who’s been spotted at Yellow Vest protests alongside Jean-Marie Le Pen’s former speech writer, Alain Soral. Both men have been convicted of anti-Semitism several times. Dieudonne has been charged with “inciting hatred” due to “homophobic, racist and anti-Semitic” comments made during one of his performances in Belgium, and has several convictions in France for making anti-Semitic comments. Soral has also been charged with inciting hatred of Jews because of an anti-Semitic article he posted on his website. Alain Finkielkraut, whose Polish-Jewish father survived deportation to Auschwitz, told the French press he sees the influence of both Dieudonne and Soral in the rise of anti-Semitism. “We mustn’t underestimate their influence. Their dream is to unify a multi-cultural France behind a hatred of the Jews,” he said. Conspiracy theories are popular with the Yellow Vests. Their distrust of the mainstream media has pushed many of them into social media echo chambers. Videos about the Rothschilds, the famous Jewish banking dynasty, have been widely circulated on Yellow Vest Facebook pages. In the wake of these anti-Jewish attacks President Emmanuel Macron announced a crackdown on the “scourge” of anti-Semitism and said a draft law would be presented to parliament in May aimed at tackling online hate speech. “Anti-Zionism is one of the modern forms of anti-Semitism,” Macron declared controversially, adding that in response, France will adopt the International Holocaust Remembrance Alliance’s definition of anti-Semitism. A handful of senior Yellow Vests have publicly denounced anti-Semitism within the movement and several also took part in what the organizers estimated was a 20,000-strong demonstration against anti-Semitism last month. But in a movement with no clear organization or cohesion, there is yet to be a collective disavowing of anti-Semitism, with many of the self-proclaimed leaders remaining silent. Yellow Vest turnout has been dwindling and the movement’s wider support has waned significantly. But Friday will mark the beginning of a three-day sit-in held in Paris, climaxing with a large protest on the weekend of March 16/17 to mark four months since the movement began. Some worry that the moderate majority may be once again overshadowed by a radical and dangerous minority.